Jama Software was looking to sell higher and broader into prospect organizations. Implementing Force Management's methodologies across its organization, built alignment and increased new and expansion business by 50%. Alignment and consistency around the prospect conversation and qualifying opportunities. Vertafore cut ramp-up time by 50% with Command of the Message. Ping Identity saw opportunity in its marketplace to transform from selling one primary capability, Single Sign-On, to sell more enterprise solutions. Can you confidently say your team excels at driving higher win rates, larger deal sizes, higher margins, and predictable revenue? 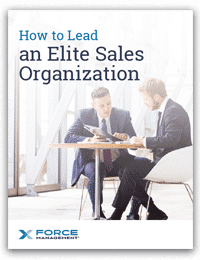 Download your FREE eBook on How to Lead an Elite Sales Organization!